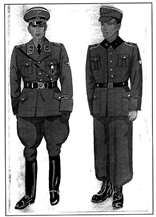 These records provide important information on Operation Foxley, the plot to kill Hitler. There are harrowing intelligence reports on the concentration camps discovered by SOE agents. The files provide significant evidence on the atrocities at Auschwitz, Dachau, Oranienburg and Buchenwald. Operation Vivacious describes the sabotage of a V2 factory. Operations Frilford, Coland and Clint show how sabotage was used to disrupt German railway lines and communications. There are also good examples of black propaganda produced by SOE defaming Axis leaders, a plot to kill Himmler, and accounts of co-operation by Germans to overthrow the Third Reich.